Though more and more real estate platforms are developing mobile apps, having a web platform is still important. Over 90 percent of real estate firms have websites, according to the National Association of Realtors (NAR). Buying and selling houses are important decisions. So people don’t only swipe in mobile apps when it comes to buying a house. Most of them turn on their laptops to search thoroughly. And statistics collected by NAR show that 95 percent of all home buyers are searching online. No wonder. Online search makes it easy for buyers to compare homes and choose the exact features they’re looking for. A website also shows the credibility of a real estate business. It’s what gives the first impression to potential clients of a real estate agency. To make a strong first impression, a real estate web platform should work flawlessly and be handy for agents, home sellers, and home buyers. A commercial real estate platform is a place for agents, home buyers, and home sellers. It’s quite a challenge to satisfy all three of these groups. To choose the features you need to focus on, think of different users’ needs. What’s important for home buyers and sellers? How can you make your software platform useful for real estate professionals? Paying attention to the user experience for your platform’s three main groups is key to success. Let’s start with the very first thing your platform users will have to do – register. 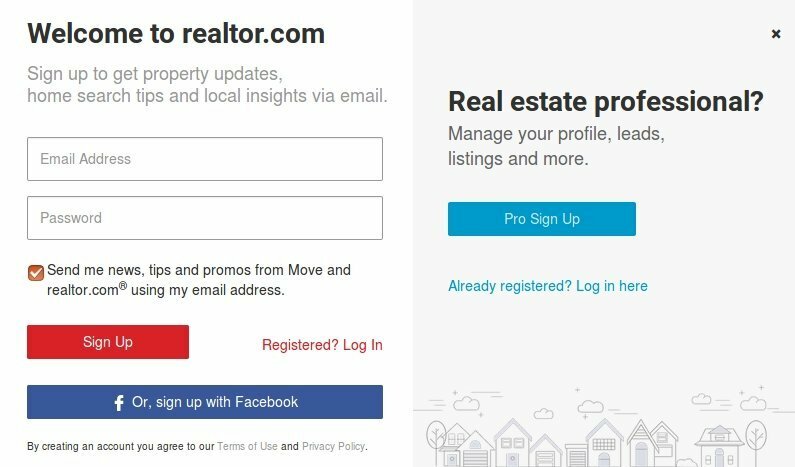 Usually, real estate platforms offer two types of registration: via email and via social login (using information from a social networking service such as Facebook, Twitter, or Google+). You can provide both registration options to let users choose. Profiles on your real estate platform should let users take different actions – users should be able to switch roles on your website. Today, a user may be searching for a new house, but tomorrow they may want to sell a house. Also, you might add more than buyer and seller roles – for instance, you might add roles for landlords, renters, investors, and others. You could also provide a separate registration for professional real estate agents, as they use other features than home buyers and sellers. Think about how you could make searching for the right house as easy and comfortable as possible. Think not only about realtors but also about buyers. We’ve looked through three real estate platforms – Zillow (US), Trulia (US), and Rightmove (UK) – to learn which filters are essential. Find out what the main questions or problems are with real estate services in your area. Based on that, consider adding some other useful filters to improve the user experience. For example, you might add search by school. It’s very important for lots of families to find a home near the right school. So an advanced school search can improve the user experience. Filters may vary from school type to grade level or even number of students per teacher. The crime rate is another major subject that prospective home buyers want to know, so you could also add filtering by crime rate. There are two main listing feed designs: a list and a map. You can combine both on your platform, like Zillow did, so users can choose the most convenient format for them. It’s hard to imagine a real estate platform with no maps, as the location of a house may be one of the most important pieces of information for prospective buyers. Maps should be intuitive and easy to use. People are quite used to Google Maps, so it’s a common solution to implement the Google Maps APIs in real estate websites. Besides, you can create a custom view with Google Maps, adding your brand’s colors and icons. You can also add lines to define neighborhoods or regions. Another advantage of Google Maps is its Street View feature. Street View lets users check how buildings look not only in photos given on the listing page. Plus, maps let home buyers find out about nearby parks, shops, and parking spots. This saves time for prospective buyers as well as agents. In 2015, professional interior photographer Harry Lim took photos of a house that had been on the market for eight months. After posting the new photos, the house was sold within eight days. There’s no need to argue that photos are a central part of a real estate platform. It’s simple: if you like the way a house looks in photos, you’re likely to be interested in buying it. A real estate platform should provide requirements for photos such as size, format, and resolution, to be able to manage a huge number of images. Create a guide for how to take photos of houses. 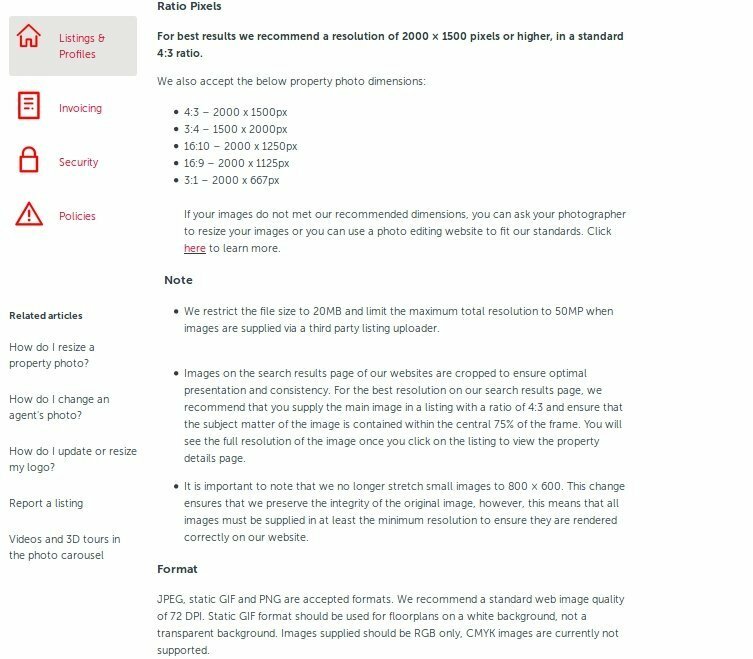 List requirements for photos to make sure your platform users maintain the same quality across your site. This feature benefits both home buyers and agents. With favorites, home buyers can save their top choices. This lets buyers return to options they’ve added to their favorites and avoid starting their search from the beginning each time they use your site. Users can also see updated information about houses they’ve chosen, such as changes to availability or price. Agents can see which houses their clients are interested in. Based on these favorite houses, an agent can provide more suitable options for their clients. An integrated payment system is another key feature of a real estate platform. Consider integrating PayPal, Braintree, or Stripe. There’s a wide variety of APIs and methods to choose from. Think of the region your platform focuses on and determine the most used payment gateways in that area. Don’t forget that integrating a gateway’s API will place the responsibility for credit card data security on your platform. Twilio is a platform that lets you embed voice, chat, and video messaging into web, desktop, and mobile software. Layer provides powerful APIs and SDKs that give you total control over backend logic and the flexibility to integrate with existing services. It also enables chat, voice, and video messaging. PubNub offers flexible real-time APIs and a global messaging infrastructure. Most real estate platforms have calendars so that realtors and potential buyers can know when houses are open for showings. A calendar is very convenient for a real estate platform as it reduces time spent checking available showing times. Real estate website developers can create calendars specially for a platform or implement APIs. You can use the Apple, Google, or Microsoft calendar APIs, for example. Or you can implement an open source calendar that gives you the opportunity to change how it looks. For more information, read our article on how to create or implement a calendar in your app. You’ll have lots of things to tackle when developing a real estate platform. We decided to take a look at some of the most common issues that real estate platforms face, such as speeding up load times and integrating IDX listing feeds and CRM systems. We’ll also reveal why it’s crucial to create a responsive website. First of all, if you want users to spend more time on your platform and revisit it, your website should be fast. The listings feed should load quickly. And, most importantly, all photos should be high resolution yet still load fast. On average, the maximum load time of a web page is three seconds. If your site takes longer, you’re in danger of losing potential clients. Site speed impacts traffic and user engagement. Actually, the longer a page takes to load, the less time is spent on the page on average. Let’s see what you can do to speed up your real estate website. Optimize images. To speed up your website, you can start with optimizing the images. Real estate portals have plenty of them. Because photos are crucial when it comes to choosing houses, don’t decrease the resolution of images. One solution is to compress images so the quality is preserved while the size is reduced. Reduce the number of plugins.Of course plugins are useful, as they can add functionality to your site and improve the user experience. Moreover, they help to avoid messiness in code. These advantages prompt developers to add more and more plugins. Bad news is that having a lot of plugins affects the speed of your website and can even cause crashes. Cut unnecessary plugins to improve site speed. The Internet Data Exchange (IDX) is essential for a real estate platform. 95 percent of real estate websites use IDX listings. Why is IDX so popular? Because it lets you pull listing data from a Multiple Listing Service (MLS) and integrate these listings into your website. That’s great both for agents and buyers, as information about houses that are for sale is updated automatically so buyers can check up-to-date information before contacting realtors. Having a solid real estate CRM is vital to the success of your business, as the real estate industry is all about relationships and communication. A CRM system is a tool that automatically manages interactions with clients. And because a client database is one of the most important parts of a real estate business, it should always be up-to-date and well kept. The best CRM system is one that can handle all of your business needs. It’s clear that having a properly working CRM system is key to effective communication with your customers. Read another of our articles to learn more about how to build a CRM system. Zillow and Trulia have their own CRM system – The Premier Agent App. Realtor uses the Top Producer CRM. There are lots of CRM systems; some are generic, while some are created especially for real estate. The most popular are Propertybase, Rethink CRM, and Pipedrive. A real estate website design company should create a responsive mobile website, as the number of home buyers who use smartphones to look for the house of their dreams is constantly increasing. A responsive website means that users will have an equally great experience using your platform on different devices, from desktops to smartphones and tablets. A responsive website makes sure that platform data can be accessed across all devices. But there are more reasons why your website should be responsive. Responsiveness helps increase the number of leads you get from your site. As mobile and tablet users also have access to your real estate platform. Also, Google is quite happy with responsive websites. Actually, Google strongly recommends responsive design. As all of responsive website pages have the same URL, it’s simpler to index and crawl them. A platform is about community. Your website should provide information and services that are commonly needed when selling and buying houses. If you want your platform to scale, you should make sure that users engage in social activity on it. Let’s see what can be done to create a community on your real estate platform. Why is a blog so important? Because it’s a great tool for generating traffic from social media and search engines. First of all, your real estate website platform should be a place that users come back to again and again. Create a blog so that people can engage, leave comments, and share opinions. All the real estate platforms that we’ve reviewed have their own blogs. Another way to build a strong community is searching for professionals. You can offer any services on your platform that are connected with real estate. By offering commonly required services, your website can attract users not only when they’re looking for new homes but also when they need anything connected with home improvement. There are lots of services that are connected with real estate. For example, mortgage calculators and mortgage comparison tools are essential features of a real estate platform. These tools benefit home buyers, as they don’t have to look for a mortgage somewhere else. It’s great if buyers can compare rates from different lenders to find the best loan. A moving service is also a necessary part of changing homes. You could integrate a service in your platform so users can both buy or sell houses and request moving services on your website. To build a successful real estate website, you should aim not only to design a great listings feed but also to create a community on your platform. Pay attention to the services people typically use when buying, selling, or renting houses. Try to provide all the necessary services so that users don’t need to leave your platform in order to find additional real estate-related information. Choose a real estate web development company wisely and make sure that it’s able to handle all the problems your platform might face. Providing search for professionals will encourage customers to use your real estate platform actively. Become a platform that gathers professionals of different fields: real estate agents, home builders and designers, property managers, and others. Make your platform associated with all matters connected with real estate. What Technology Stack Do Zillow, Redfin and Realtor.com Use for Property Listings?